Monument Square Building was renovated as the Children's Museum, now a beloved building for families. Grand Rapids Savings Bank was Grand Rapids early skyscraper at 13 stories. Westminster Presbyterian Church is a beautiful Gothic structure at LaGrave and Weston. The beautiful Keeler Building by Osgood & Osgood is in need of renovation. It sounds like this may be coming soon. Watch for information on this important building on Division Street NW. 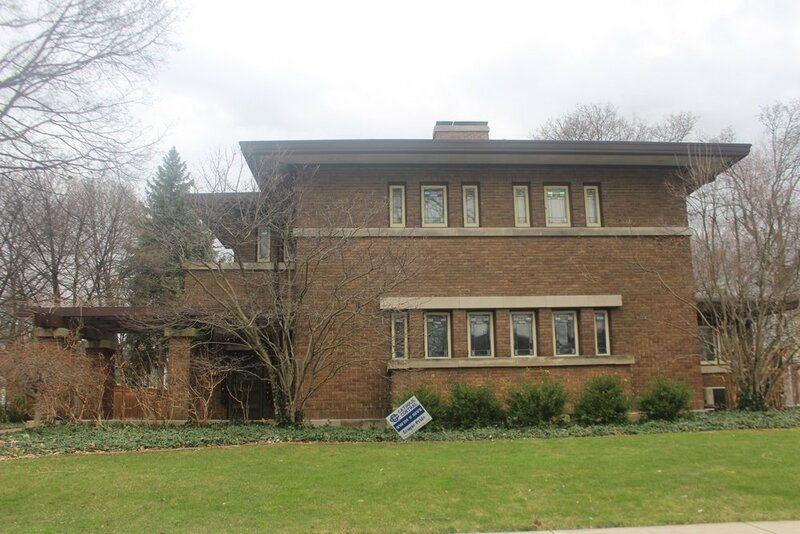 This Prairie style home with carport and cantilevered second floor porch was designed by the Osgoods from published plans by Frank Lloyd Wright, provided by the owners. 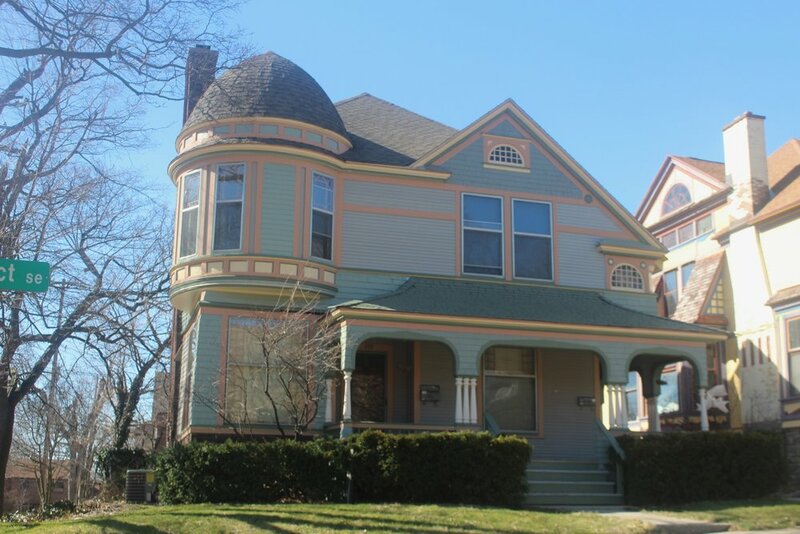 1885 Late Victorian with Eastlake Details. Two story cross-gabled home with elaborate gable stick trim and window trim. 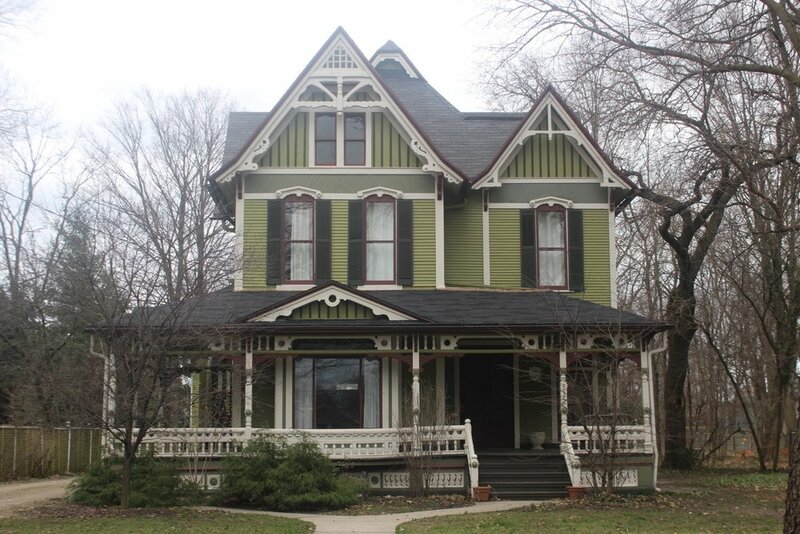 Low pitched hipped roof over full-facade porch with Queen Anne style turned spindles. Completed while in partnership with architect David S. Hopkins. English style twin-gabled home with half-timbering, brick porch with bungalow details designed for Senator Vandenberg. 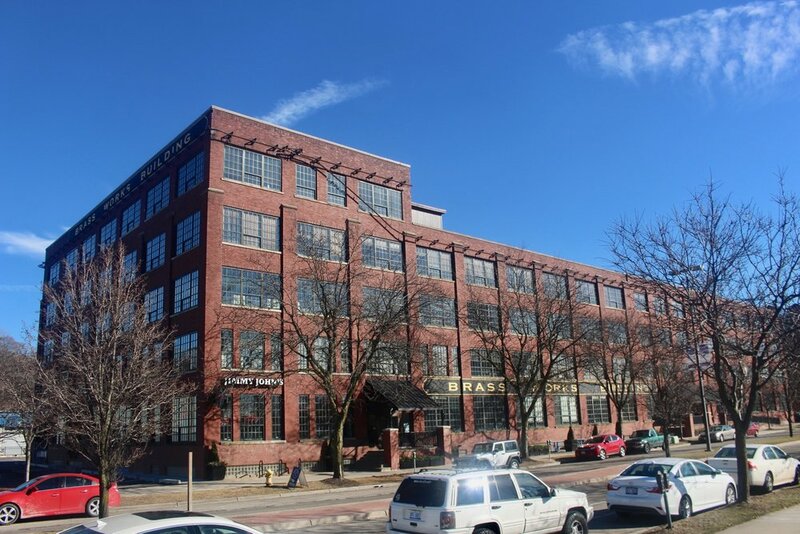 The iconic Wolverine Brass Factory is a busy and well-used commercial building and has a great location with a park across Monroe from the building. Designed for Frederick Wurzburg by Sidney J. Osgood. English style with lovely windows and renaissance style curved entry overhang. Steeply pitched gables. Located on Plymouth at Robinson. Smith Memorial Church on Hall west of Grandville Avenue was constructed in brick with stone trim, a square tower and gothic window, a more restrained version of the late Victorian/Queen Anne style churches Sidney Osgood designed in the 1880's. It is still used as a church by a local congregation and has a dramatic drop off on the west side of the building as the street plunges down around the curve to Godfrey Avenue. This wonderful old church, completed in 1886, sits on a high point overlooking the city, and has a soaring square tower that is visible from a long ways away. The rounded entry arches and stone facade are prominent Richardson Romanesque features. The siding is not lovely, and there are many stained glass windows that are in decay. This researcher wishes there were some party that would restore the building, but rumor has it that this structure may be torn down. Sidney J. Osgood, F.A.IA. came to Grand Rapids in 1876 and began working as an architect at a time when the city was growing and changing. He found plenty of work in the bustling city erecting churches, homes and commercial buildings. Osgood partnered early on with David S. Hopkins. Their short partnership can still be seen in the beautiful Gothic style Westminster Church and the elaborate Eastlake styling of the home at 535 Fountain NE. Elaborate Eastlake styling added to the Davis house at 535 Fountain NE in the remodeling by Osgood and Hopkins. 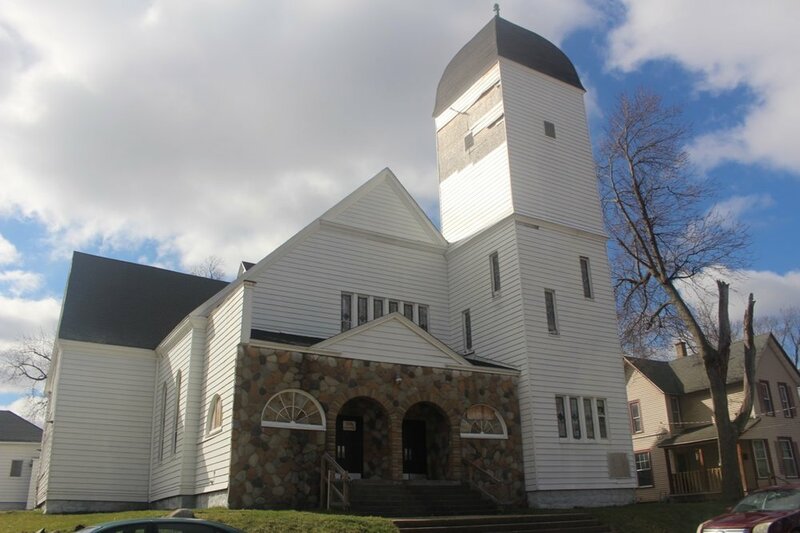 After Hopkins left to establish a successful architectural plan business, Osgood went on to many Grand Rapids churches for the new Dutch immigrants who wanted something impressive but within their budget. The answer was the Queen Anne style frame churches Osgood designed, avoiding the higher costs of more traditional masonry churches. By 1884, Osgood was a registered member of the American Institute of Architects. One of Osgood's most significant early buildings was the monumental Richardson Romanesque style Kent County Courthouse. The cornerstone was laid in 1889 but that building was lost in the 1960's during the urban renewal era. Osgood also designed other county buildings, including the Mason County Courthouse still prominent on the main street of Ludington and the Muskegon County Courthouse (1893), also still standing. It eventually became the Muskegon school district offices. In 1888 Sidney Osgood designed the Grand Rapids Masonic Home on a site overlooking Reeds Lake, but it was destroyed by fire not long after it was completed in 1889. After the fire, it was never rebuilt. Instead the area was platted for homes as the " Masonic Addition." Today, it is one of East Grand Rapids most popular residential areas full of bungalows, English cottage designs and historic revival styles, bounded by Breton, Lake Drive and San Lu Rae and Argentina Streets. When Osgood's son Sidney Eugene (Gene) graduated from Cornell in 1903, he immediately went into practice around 1902 with his father, forming the firm of Osgood and Osgood. While they were very busy adding to the architectural footprint of Grand Rapids, they also worked beyond the city. They designed Masonic Temple buildings around Michigan and in other states and were asked to design Grand Rapids current Masonic Temple on the East Fulton Street approach to downtown. Grand Rapids Savings Bank at Monroe Center and Ionia by Osgood & Osgood. 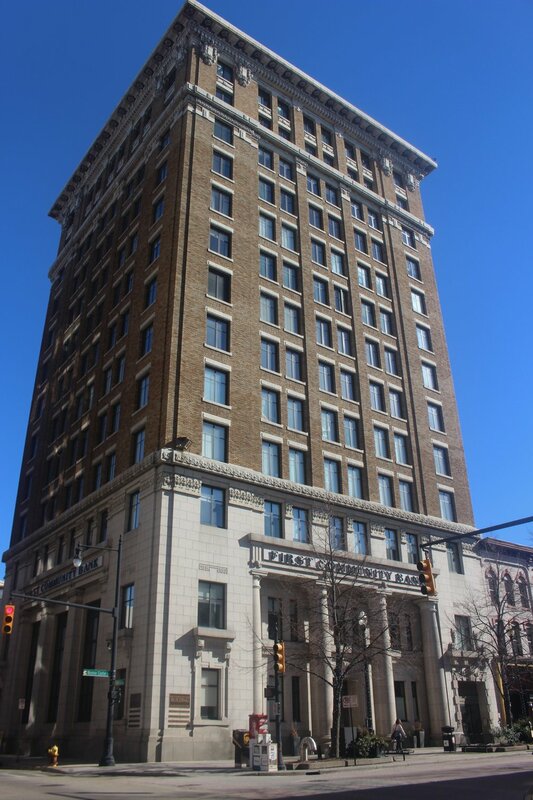 The work of the father and son duo varied from commercial to civic to banks to manufacturing facilities and homes, many located in the downtown and central city area. They designed the Grand Rapids Savings Bank, at the corner of Monroe Center and Ionia. At 13 stories, the building was completed around 1920 and is considered one of the early Grand Rapids bank skyscrapers. Sidney J. Osgood was eventually was awarded the prestigious designation Fellow of the American Institute of Architects (FAIA). He died in 1935 and his son Sidney Eugene died in 1952, effectively completing the architectural legacy of the Osgoods. In 2010, the Grand Valley Chapter of the American Institute of Architects acknowledged their contributions to Grand Rapids architectural history when they awarded the Osgood Award at Art Prize. The Osgoods are an important part of the Grand Rapids Buildings Archive of over 100 architects and builders will be part of a book to be published soon on Grand Rapids Architects and Builders.